It’s a challenge we have daily, the sharing of articles we read in a newspaper or magazine. Yes, we still have both around the office. Now, we take a picture of the text and email the image. 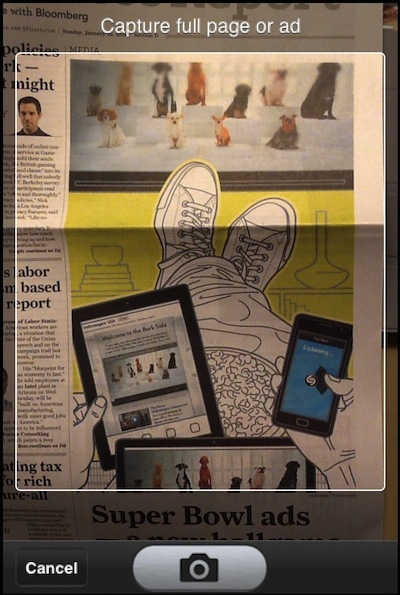 Or, we go online and search, hoping that the print article is also online… find, then copy/paste the URL to a email. A solution was presented to us today for a method we never thought of before. 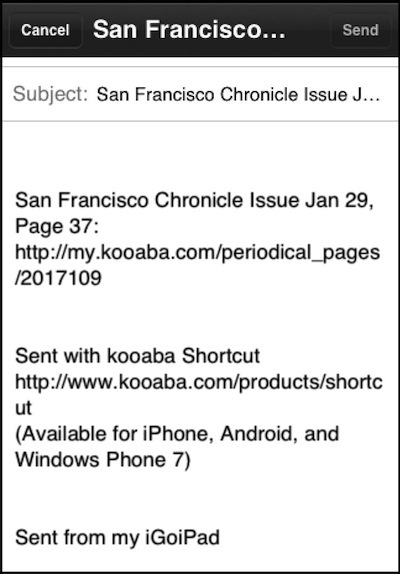 The app Kooaba Shortcut does all the work for us. Just snap a photo of the article, Kooaba Shortcut searches newspapers, magazines and marketing materials around the world to provide you a link that you can share. The service’s list of content they search against keeps growing, if your curious visit their site to find your favorites (www.kooaba.com). You do not need to tell Kooaba Shortcut which services to search, they check all of them for you. Lauch Kooaba Shortcut and take a picture of the article you would like to share… or read later. Pictures of the images work best. In our tests, we found that pictures of text had a lower successful return. And, a photo of a teaser article rather than the full article almost never resulted in getting the full content to share. 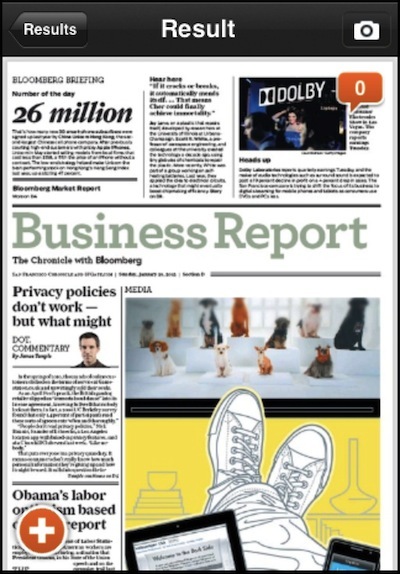 Sometimes an article can be found in multiple print publications. 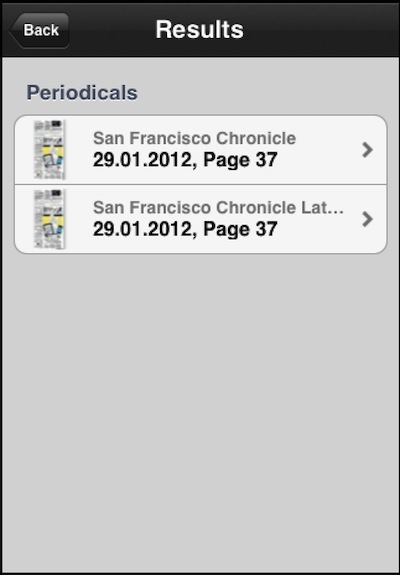 Kooaba Shortcut will give you a list of all periodicals they found for you to choose. If you pick one you didn’t want, you can return to the list without having to research. Choosing one of the articles gives you the full page the article as it was printed, not just the text. Tap the speech balloon to read comments from others or add yours. 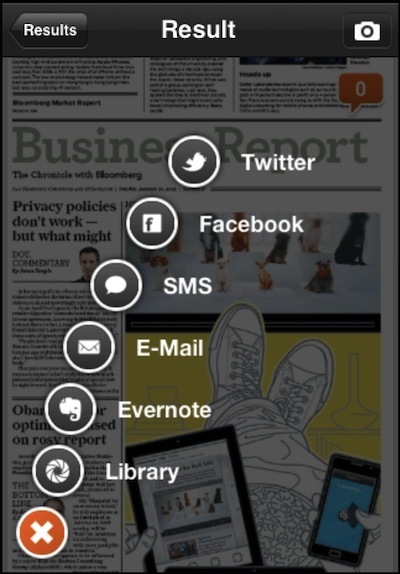 Tap the ‘+’ to bring up a list of options to store/share the article. ‘Library’ is the Kooaba Shortcut service which requires you have a membership for the service. Evernote requires you are logged into Evernote, the Facebook/Twitter options are nice to push directly to those social services. Choosing the email option creates a new email with a link for others to use. Notice that the link isn’t directly to the newspaper/magazine, rather it links through the information proving service. 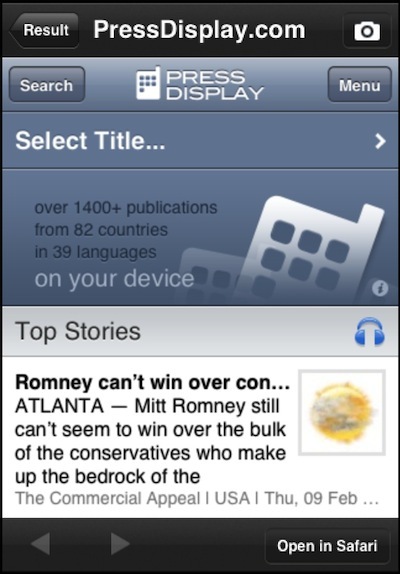 Back on the image of the article Kooaba Shortcut found, double tapping on it will take you to a list of the latest news. As you can see from the screenshot below, the whole back end of the service is Press Display. Selecting an article will give you the full story to read/share.